Yay! 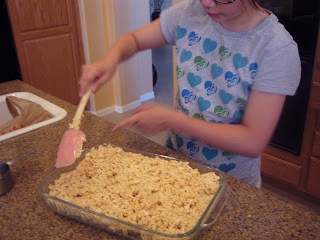 Sabrina is making Rice Krispie Treats. Her grandfather dropped several hints that he would like them, and since they are coming over tonight, she thought it would be nice to surprise him with a batch! 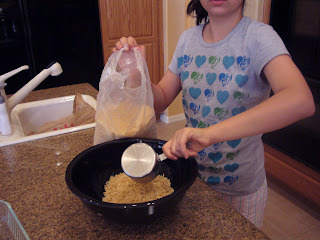 Next, measure out your Rice Krispies cereal. 8 and 1/2 cups of cereal for this batch. Make sure you put the cereal in a large enough bowl - you need plenty of room. 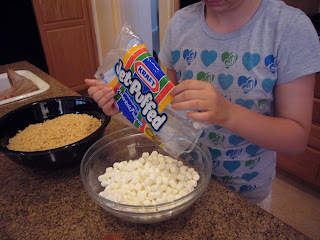 Now, measure out 1/4 cup of butter and one 10.5 ounce bag of mini marshmallows. Microwave the butter and marshmallows for 1 minute on high. Stir, then microwave for another 30 seconds until the marshmallows are just about melted. Stir well until you have a smooth mixture. Be careful, it is hot. 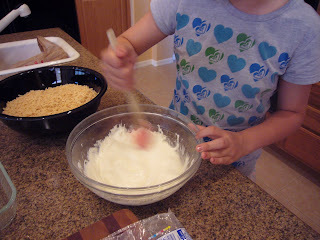 Now, pour the melted marshmallow mixture over the cereal and start mixing. 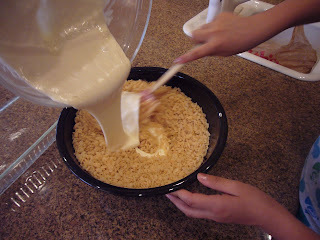 Work quickly because the mixture is very sticky and once it cools down you won't be able to mix it. Ta-da! 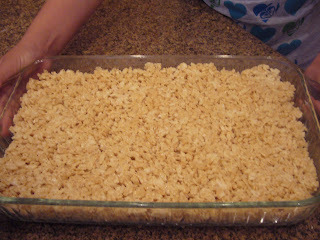 Now, set the pan aside to cool completely, then cut into squares. We are going to dip half of the squares into chocolate to see how they come out. We'll post pictures of those later. I love these! 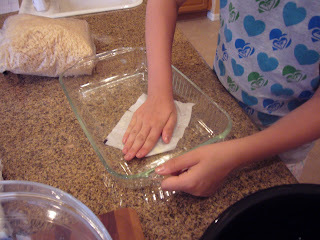 I just found your blog, and absolutely love that you guys are in the kitchen!